Special Set containing Day, Night Creams and Eye Serum from Caviar Revival Series. 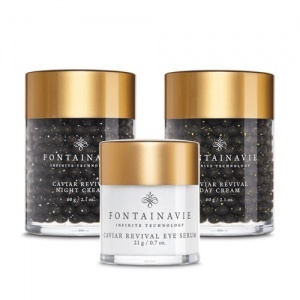 Caviar extract – the fountain of youth coming from the depths of the sea. It has rejuvenating and moisturising properties, contains valuable nutrients, such as amino acids and essential fatty acids that are beneficial for the skin. Bio collagen – natural marine collagen an ingredient of exceptional purity and concentration; responsible for the tension, smoothing and firming of the skin. It moisturises, rejuvenates and regenerates, creates a delicate protective film against excessive loss of water. Diamond-peptide complex – has anti-ageing properties, improves the flexibility and elasticity of the skin. Hyaluronic acid – moisturises and nourishes the skin.